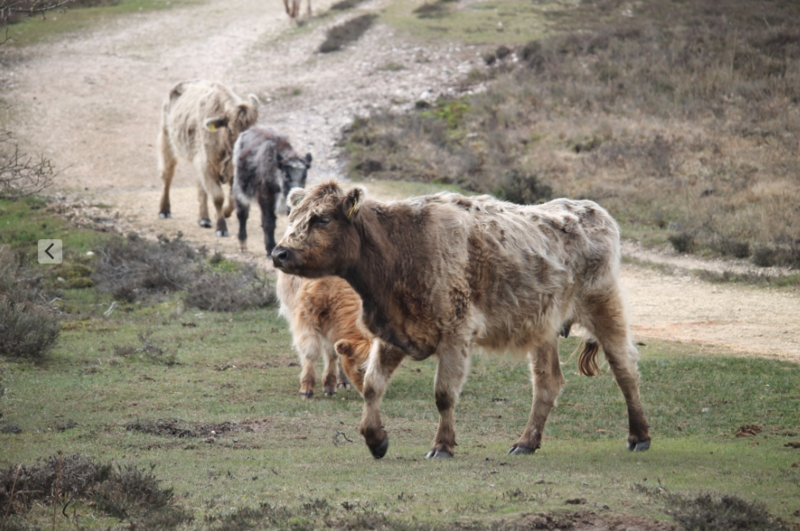 The free-roaming commonable livestock on the New Forest are checked regularly to ensure their welfare. The free-roaming ponies, cows, donkeys and, during pannage, pigs on the New Forest are usually able to take care of themselves and do not require the constant attention required by their intensively farmed or field-kept counterparts. Even the process of giving birth, which is one of the most vulnerable times for any animal, can generally be left to nature’s devices, the success of which is exemplified by the numbers of healthy foals and calves to be seen on the Forest at present. This doesn’t mean to say that the animals are just left to get on with it – quite the opposite. The commoners, supported by the Agisters, check the animals regularly to ensure that the welfare of the commonable livestock is maintained to a high standard. There is also the added vigilance of over 13.5 million day visitors each year who are able to alert the authorities, such as the Verderer’s Office or the Forestry Commission, to anything that they think is amiss while out and about in the New Forest. However, any animal that is deemed to be in need of medical treatment or health care will be removed from the Forest by its owner until it is sufficiently recovered and well enough to be returned to its semi-feral lifestyle. Many commoners believe that the free-roaming animals are able to self-medicate, by seeking out varieties of Forest plant, herb or shrub, if they feel unwell. The animals have even been seen licking or eating soil and clay, which may contain ingredients that act as an antacid or antidiarrheal treatment. The commoners point to the way the ponies eat the burnt stalks of gorse, after it has been charred through controlled-burning of the heathland, as an example of how they use the black jacks to relieve themselves of internal parasites, such as tapeworms. Scientists have confirmed the commoner’s belief in animal self-medication by observing that ‘most natural landscapes are diverse mixes of plant species that are literally nutrition centres and pharmacies with vast arrays of primary (nutrient) and secondary (pharmaceutical) compounds vital in the nutrition and health of plants and herbivores’. Even though the commonable livestock is free-roaming they are not wild animals. Many will experience periods of close human contact, such as when they are brought in off the Forest for the winter. These animals will know the benefit of food, shelter and possibly even a little mollycoddling. In some instances, if these animals become unwell and are unable to treat themselves they will return home to seek some creature comforts. Such was the case recently with a commoning friend of mine who had to tend to a heifer suffering with a swollen foot and lameness. The young cow had had the sense to return home and, apparently, was bellowing outside the farm gate for attention and looking generally miserable and forlorn. The cow was duly ushered into the farmyard where an inspection could take place and any treatment could be applied. The cause of the swelling was deduced to be as a result of an adder bite. Small tell tale puncture marks were observed in the cow’s heel. Such an occurrence is not unusual in the New Forest. 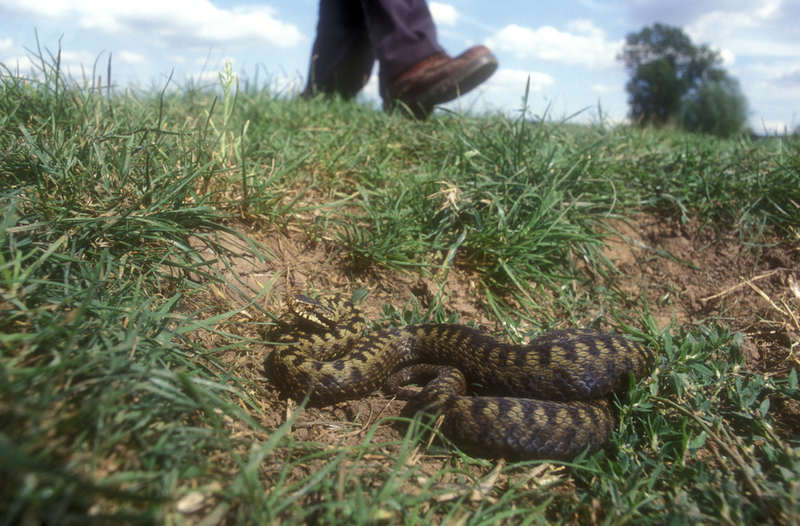 Adders will protect themselves if threaten by hooves, paws, snouts, feet or hands! Luckily their venom is not fatal and sometimes they will dry bite, as a warning, without injecting any venom, but in either case it can be very painful. In this little cow’s example after a few days of treatment, to ensure there was no lingering infection, and some stable rest her distress at being separated from her bovine friends became greater than the inconvenience of a sore foot. Much recovered and no longer lame she was duly returned to wander on the New Forest none the worse for her malady. J. J. Villalba and F. D. Provenza (2007). ‘Self-medication and homeostatic behaviour in herbivores: learning about the benefits of nature’s pharmacy’, Animal, Vol.1, Issue 9. This entry was posted in New Forest cattle, New Forest flora & fauna, New Forest pony and tagged adder, Agister, animals, cattle, commoners, commoning, cows, donkeys, Forestry Commission, healthy, heifer, injured, lame, New forest, pharmacy, pigs, ponies, self medication, sick, snake bite, unwell, venom, Verderer, welfare standards. Bookmark the permalink.